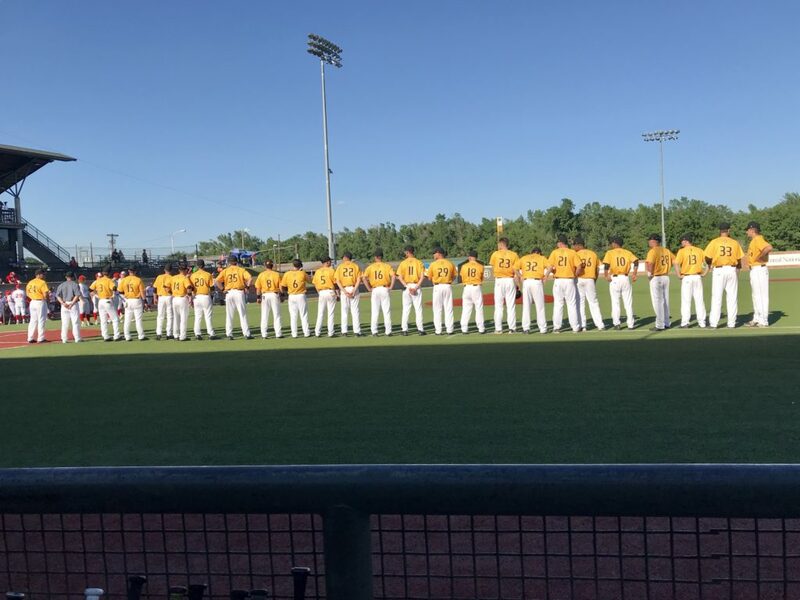 ENID, OK. — The Monroe Community College baseball team sent eight batters to the plate in a three-run third inning, but it wasn’t enough as the Tribunes fell to Sinclair Community College, 9-3 in the NJCAA DII World Series action at David Allen Memorial Park, Sunday. The loss dropped Monroe to 30-20 and ended the 2018 season. Cas Sobaszek reached base three times in the game including a base on balls in the third inning when Monroe pulled within two runs at 5-3. Matt Pilarczyk started the stanza with a walk. Matt Wagner hunted down a first-pitch fastball and knocked a single into left center to spark the rally. Justin Bunting followed with a sacrifice bunt, and Brennen Smith put the Tribs on the scoreboard with an RBI base hit. Andrew Czubaj brought in another run when the MCC catcher worked a bases loaded free pass, and Phil Ferranti capped the inning with an RBI-sacrifice fly. It looked like the Black and Gold would add more runs, but Sinclair centerfielder Sean Darmafall chased down Sam Loew‘s drive into the left center gap for the final out of the inning. “We got out of that inning what we needed,” head coach Dave Brust said. “We needed another inning or two just like that. The Black and Gold managed just two more hits for the rest of the game. Frankie Pizzo came out of the bullpen and hurled four shutout innings before allowing a pair of runs in the sixth. The sophomore right-hander struck out two and walked two. Sinclair added a run in the seventh and another in the eighth. Ferranti collected his 76th hit of 2018 with a leadoff single in the ninth. Nate Grabowksi (2008) holds the single-season program mark with 87. Ferranti’s third-inning RBI was the freshman’s team-leading 63rd of the year. Sobaszek ended the campaign with an on-base percentage of .535 – good for 14th in the country. Of the 13 players in front of the freshman shortstop, only three played more games. Monroe won 18 straight games leading into the World Series – the longest streak in NJCAA DII and the best run in program history since the 2005 squad which won 21 in a row. Hall-of-Fame coach Dave Chamberlain led the 1989 team to a program-record 29 consecutive wins. The NJCAA World Series appearance was the ninth in MCC history and second in three years under Brust. Monroe’s 2008 club finished a program-best third place.